Monday through Saturday 10:00 am to 5:00 pm. We are closed Sundays and City Holidays. The Rock Springs Historical Museum is housed in the original Rock Springs City Hall. The building was built in 1894 at an original cost of $28,200. The funds for the construction did not come from the ever present Union Pacific Coal Company and Railroad, but from revenues collected in the issuing of liquor licenses. The building is built from native sandstone and boasts an impressive 14-foot foundation that was made necessary by the presence of ''quicksand'' at the site. 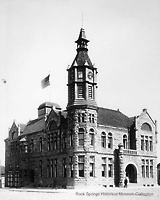 It served as the City Hall, Police Station and Fire Station until the early 1980's, when the new City Hall on D street was completed. The museum houses many exhibits on the history of Rock Springs with special emphasis on our coal mining and multi-national heritage. Exhibits rotate regularly, so be sure to stop in often!